"Thank you for showing me the attention (by doing an interview with me) in this difficult time, it means a lot. Many are spitting in my face right now but life is not on hold and because an athlete's career isn't a lifetime I must move on and make the most of the time I have." - Lukas Verzbicas in a Q & A with triathlon site Slowtwitch.com. Can Lawi Lalang be stopped? Now That London Has 2017 Worlds, Usain Bolt May Delay Retirement Until 2017 Originally, he said he'd retire in 2016. He'll be 31 in 2017. King Carl won gold in Atlanta at age 35. We think Bolt should be guilted into competing through 2020. Kenyan Press Asks: Was Vivian Cheruiyot Cheated Out Of World Athlete Of Year Award? 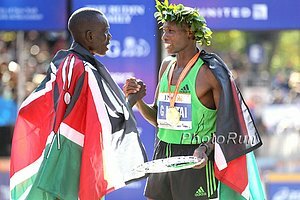 It's easy to say "yes" as Cheruiyot won three world titles but Pearson had an almost undefeated season. Sally Pearson Nearly Missed IAAF Awards Galas As She Went To The Gala In Her Hotel Only To Realize It Was A Police Function , Not Awars Ceremony The IAAF gala was down the road. Sally Pearson Is Surprised She Won - Says Valerie Adams Is A Role Model "It was a little surprising that I won. Vivian was a three-time world champion and Valerie just dominates every time she's out there. She's the role model athlete everyone should look up to." David Rudisha Says Discipline Is Key To Staying On Top "It's always tough for a champion to maintain your position when you're on top. But the most important thing is to be disciplined. It's important to keep in mind that what I have done has already passed. What is important is what will come tomorrow." If Only Jimmy Carter Had Been This Smart: Good News: Despite Suspension From Arab League, Syria Will Compete In December's Arab Games "We never mix up politics with sport, so they are most welcome to come to Doha." Usain Bolt And Sally Pearson Are Surprising 2011 IAAF Athletes Of The Year And $100,000 Richer Vivian Cheruiyot won just about everything she ran but it wasn't enough. Yohan Blake was pretty damn good but journalists must have had trouble giving it to a guy they figured would lose if he raced Bolt. Personal Crisis Likely Led To Disappearance Of UAA Star Runner He went missing in near 0 degree temperatures for 2 days and was found with frostbite. London To Host 2017 Worlds And Qatar Made Sure They Paid A Ton To Do It More money for the sport is a good thing, although we think the British taxpayers could be on the hook if things don't go as planned. London, however, says it will sell $1 Billion in Sponsorship. *Although Qatar Lost London 2017, It May Get 2020 Olympics And has the 2022 World Cup. *Denise Lewis On Seb Coe: "Lord Coe's speech made the hairs on my neck stand up." * It's Official: Lukas V Leaving Oregon For Triathlon Hard to believe one of the best high school runners' college career lasted less time than Kim Kardashian's marriage. Lukas is leaving the Ducks 2 days before regionals. Hard to believe no adult told him to wait until after the season - wait a minute - it's hard to believe the adults are all gone and having teams jump from conference to conference with no loyalty whatsoever. In the year 2011, self interest rules. LRC NCAA Regional And National Fan Polls Released Wisconsin solidifies its spot as #1 while FSU stays on top on the women's side. IAAF Gets Smart - Top 15 Finish At World XC Now = "A" Standard In 10,000 Also Diamond League winners will automatically be placed in the World Champs, but a country is still limited to a max of 4 per event. 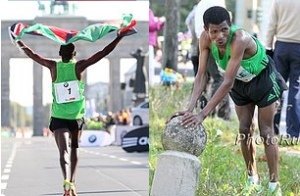 IAAF Stays Stupid - List Of IAAF World Junior Records - Sadly, Isaiah Koech Has 2 German Fernandez has one. 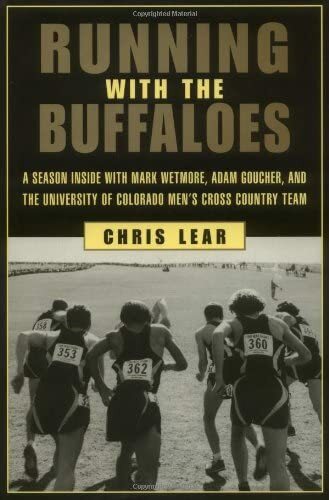 Discuss: MB: LetsRun.com's (JK's) Official 2011 NCAA XC Regional XC Predictions And you can always give us your predictions in the LRC NCAA Fan Polls. Phil Hersh Gets Something Right: London, Not Sexist Doha, Should Get 2017 Bid Meanwhile, some wonder if Hersh's anti-Hall rants are related to Hall's faith. A Look At Where The Various Will Be Training In Britain Pre 2012 The US will be in Birmingham. NYC Marathon App Fails To Work As Promised & App Maker Says Too Many People Were Using It The app users now know how we feel when we try to watch most races online. Pan AM LJ Gold Medallist Tests Positive Venezuelan LJer Victor Castillo tested positive for methylhexaneamine, which is found in energy drinks. Sympathy? Not so much. A 2-time offender - he may be banned for life. *Chad Hall Taking Ryan Hall's Advice & Enjoying His Senior Season "(Ryan's) encouraged me throughout all my seasons, but especially this one. Kind of just, 'Get out and enjoy it. Do your best and leave the outcomes up to God.' We've both dealt with disappointments and stuff. His message to me is about having disappointments and coming back and doing well." Imane Merga & Linet Masai Win In Madrid As IAAF XC Season Gets Underway The reigning World XC champ didn't secure the win until the very end, whereas Masai dominated by 22 seconds. Matthew Kisorio's Younger Brother Wins 2nd-Straight Kenyan XC Meet Nicholas Togom is the new prodigy. Stars Joseph Ebuya (11th) and Mercy Cherono (10th) struggled. Tegla Loroupe Peace Race Recap 27:14 won the men's race. Morocco's Ennaji El Idrissi Wins Turin In 2:08:13 The Ukraine's Yuliya Ruban won the women's in 2:27:10. Moroccan Wins Athens Marathon In 2:11 As Ethiopian Wins Women's In 2:35 It's one of the most difficult courses in the world. Big-Time Traditional Powers Stay Home - Arkansas & Oregon Plus William & Mary Are Left Home On The Men's Side - The Providence Women Stay Home For 37 years in a row, you could count on the Arkansas men making NCAAs. Not anymore, as they stay home for the first time since 1973. The Providence women, who were ranked #5 in the country without even running at full strength in most meets, aren't going for the first time since 1988, the William & Mary men since 1996. And because Lukas Verzbicas quit on Oregon, the Ducks aren't going on the men's side for the first time since year two of the Vin Lananna era. *Could the region that got 6 teams last year come away with just 2 this year? Phil Hersh Talks To Lukas Verzbicas After He Quits On Oregon 3/4 Of The Way Through The Season Lukas' stepfather (a triathlon coach) reportedly wanted him to stay longer at Oregon. If this is Lukas' decision, then he deserves to be treated as an adult and criticized for quitting on his teammates. Lisa Koll Uhl Is Now Married, Back Racing Again, And Admits She Wasn't Sure About Kara Goucher Joining Her Group Now she's encouraged by it. And in case you didn't know, Adam Goucher retired this week. For inspiring half a generation of distance runners, it seems like he deserves more coverage. USATF Profile On Molly Pritz Running Times did one yesterday. Vivian Cheruiyot Has Had An Incredible 2011 She's up for athlete of the year versus Sally Pearson and Valerie Adams. After Striking Out As A Sheep Seller And Maize Farmer, Wilson Chebet Turned To Running Guys like this drove Lukas V to the triathlon. Wejo Was Right - Deadspin's Report Was Wrong - Usain Bolt Has Zero Contact With Doper Angel Hernandez Usain Bolt's agent Ricky Simms has no idea how Bolt got associated with Hernandez. "I have no idea why Usain's name was brought up. Usain has no connection with any of these people. Nobody from Team Bolt has any connection or knows any of these people." Fortunately for the sport, LetsRun.com co-founder Weldon Johnson realized Bolt is so good that boxing trainers were referring to sprinters in general as Usain Bolt. Crazy: Floyd Landis Gets Convicted Of Hacking Into French Doping Lab's Computer How he knew how to do that is beyond us. Portugese European Bronze Medallist Sara Moreira Says Tests Vindicate Her From Positive Doping Test At WCs Nope. It just shows the supplement she was taking included banned substances. She's still responsible for taking the supplement. Runner With MS Finishes NYC Marathon In 31 Hours The 23rd year she has finished on crutches. Remarkable. Remarkable: NY 3rd Placer Kebede: "I only got one month's training" After Suffering Foot Injury Kebede certainly is a talent and the foot problem apparently is what explains his subpar London. After Getting Kicked Out of Hansons-Brooks, Molly Pritz Wanted To Quit The Sport - Now She's The Top American At NY Dating between team members was a no-no, so she was forced to leave. Bryan Clay Has Been Named The 2011 Visa Humanitarian Of The Year By USA Track & Field In the six years since Clay established his foundation, he has raised more than $140,000 for schools and impacted the lives of thousands of children. Craig Mottram Reflects On 2011 - Looks Ahead To 2012 People forget he was top 20 at World XC. Great News: Missing Alaska Anchorage Runner Found Alive 2.5 Days Later Marko Cheseto went missing at 7 pm on Sunday morning and was found at 3 am Wednesday with big time frostbite. No one is really sure what happened and he may lose his feet, but the great news is he's alive. *MSBNC: Not Wearing Hat Or Gloves, Shoes Were Frozen To His Feet & All He Could Say Was "911" The report also says he was upset about his teammates' suicide but has near a 4.0 GPA. 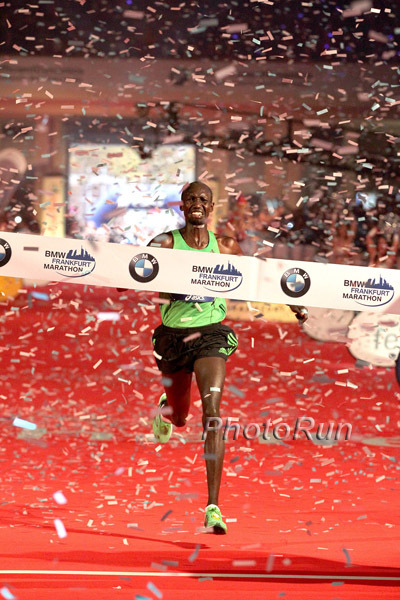 WP: Could A Sub-2 Hour Marathon Happen Soon? Meb says yes. LetsRun.com says, "No way." Gary Reed Hopes To Bring Track Back To Life "I don't know that a lot of people want to admit that, but I know it's dying. The next generation is really struggling. The numbers from junior to senior are falling off like crazy and I, as someone who got my whole life from track, would love to leave the sport better off than what I found it." LetsRun.com NCAA National And Regional Polls Open Tell us who the top 10 teams are in the country and who the will make nationals in each region.